This article is about the novel. For the film, see The Lair of the White Worm (film). For the God Dethroned album, see The Lair of the White Worm (album). 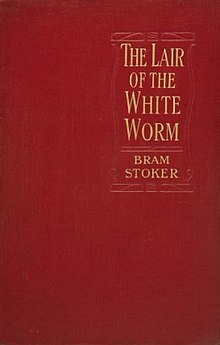 The Lair of the White Worm is a horror novel by the Irish writer Bram Stoker. It was first published by Rider and Son of London in 1911 – the year before Stoker's death – with colour illustrations by Pamela Colman Smith. The story is based on the legend of the Lambton Worm. It has also been issued as The Garden of Evil. In 1925 a highly abridged and rewritten[clarification needed] form was published. It was shortened by more than 100 pages, the rewritten book having only 28 chapters instead of the original 40. The final eleven chapters were cut down to only five, leading some critics to complain that the ending was abrupt and inconsistent. The Lair of the White Worm was very loosely adapted by Ken Russell into a 1988 film of the same name. The first episode of the German radio drama "Die Schwarze Sonne", produced by the label LAUSCH, is loosely based on the events of The Lair of the White Worm. The main characters of the radio drama are also based on the protagonists of the novel and feature in the rest of the episodes even though the plot turns away from Stoker's original story. The plot focuses on Adam Salton, originally from Australia, who is contacted by his great-uncle, Richard Salton, in 1860 Derbyshire for the purpose of establishing a relationship between these last two members of the family. His great-uncle wants to make Adam his heir. Adam travels to Richard Salton's house in Mercia, Lesser Hill, and quickly finds himself at the centre of mysterious and inexplicable occurrences. The new heir to the Caswall estate (known as Castra Regis or the Royal Camp), Edgar Caswall, appears to be making some sort of a mesmeric assault on a local girl, Lilla Watford, while a local lady, Arabella March, seems to be running a game of her own, perhaps angling to become Mrs. Caswall. Edgar Caswall is a slightly pathological eccentric who has Mesmer's chest which he keeps at the Castra Regis Tower. Caswall wants to recreate mesmerism, associated with Franz Mesmer, which was a precursor to hypnotism. He has a giant kite in the shape of a hawk to scare away pigeons which have gone berserk and attacked his fields. Adam Salton discovers black snakes on the property and buys a mongoose to hunt them down. He then discovers a child who has been bitten on the neck. The child barely survives. He learns that another child was killed earlier while animals were also killed in the region. The mongoose attacks Arabella, who shoots it to death. Arabella tears another mongoose apart with her hands. Arabella then murders Oolanga, the African servant, by dragging him down into a pit or hole. Adam witnesses the murder which he cannot prove. Adam then suspects Arabella of the other crimes. Adam and Sir Nathaniel de Salis, who is a friend of Richard Salton's, then plot to stop Arabella by whatever means necessary. They suspect that she wants to murder Mimi Watford, whom Adam later marries. Nathaniel is a Van Helsing-type character who wants to hunt down Arabella. The White Worm is a large snake-like creature that dwells in the hole or pit in Arabella's house located in Diana's Grove. The White Worm has green glowing eyes and feeds on whatever is thrown to it in the pit. The White Worm ascends from the pit and seeks to attack Adam and Mimi Watford in a forest. Adam plans to pour sand into the pit and to use dynamite to kill the giant White Worm while it is inside the pit. In the final scene, Adam Salton, Mimi Watford, and Nathaniel de Salis confront Arabella and Edgar Caswall. A thunderstorm and lightning destroy Diana's Grove by igniting the dynamite. Les Daniels noted that while The Lair of the White Worm had "potential", it was undermined by the "clumsy style" of the writing. The horror critic R.S. Hadji placed The Lair of the White Worm at number twelve in his list of the worst horror novels ever written. 1911 1st edition illustration by Pamela Colman Smith facing page 222. 1911 1st edition illustration by Pamela Colman Smith. ^ a b c "The lair of the white worm" (1st ed). LC Online Catalog. Library of Congress (loc.gov). Retrieved 2016-09-16. ^ Raymond T. McNally and Radu Florescu, In search of Dracula: the history of Dracula and vampires, page 223. Houghton Mifflin, 1994. ^ Dracula and The Lair of the White Worm, W. Foulsham & Co. Ltd., 1986, p. 8. ^ "Die Schwarze Sonne - Lausch". Lausch - Phantastische Hörspiele (in German). 2006. ^ Les Daniels, Living In Fear: a history of horror in the mass media, New York: Scribner, 1975, ISBN 0684143429, p. 63. ^ R.S. Hadji, "13 Worst Stinkers of the Weird", in Rod Serling's The Twilight Zone Magazine, July–August 1983, TZ Publications, Inc., pp. 86-87. This page was last edited on 28 November 2018, at 23:06 (UTC).